White: marble, black: burnt engine oil, 3 mirrors and metronome. 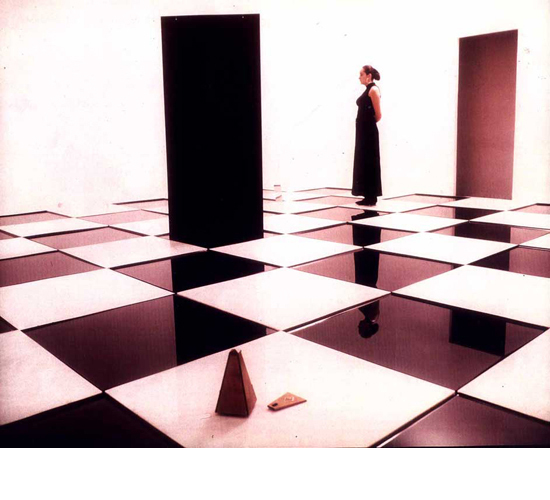 Chess Game is an interactive installation among the spectators/players. The spectators who decide to "play", walk upon the piece, come to realize the need to acknowledge, even respect one another, and that happens because they become gradually aware that one's position is depended upon the position and movement of the other so as not to fall into the black squares of the engine oil. Questions on limits and reciprocity are being further addressed by the placement and affect of the three mirrors since they were being positioned on the diagonals of the square which are symmetry axes. Furthermore at the transparent mirror the Ego comes 'face to face' with the Other, when through its own reflected image one can see (due to the transparency) the image of one's self coinciding with the image of another spectator. It is a piece that sets aside the notion of winning; in order to promote the complementary nature and the interdependence of the Opposites. The metronome, which can be rewound at will, paces Time. Balance (which can be pretty demanding when surrounded by the black engine oil, and an act that we take for granted although it takes a whole year in our lives to master) is presented as a personal as well as a collective responsibility for sustainable development in time continuum.